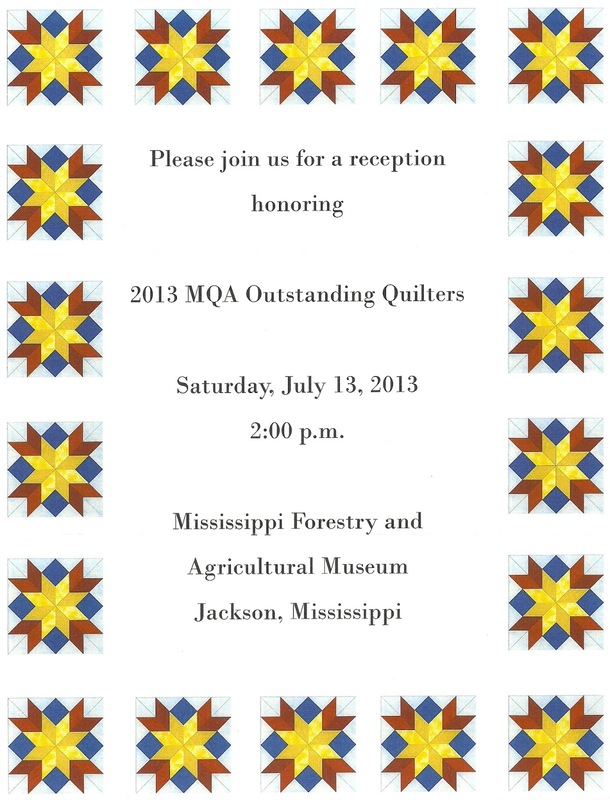 Pictured at the Reception honoring 2013 Outstanding Quilters chosen for the exhibit at the Mississippi Forestry and Agricultural Museum are eight of the ten honorees. Also shown are chairpersons of the Legacy Project, who are the organizers of these exhibits (far left) Joan Alliston and (far right) Georgia Polk. The exhibit will remain in the museum through October. The Mississippi Quilt Association was founded in 1991 to enhance the art of quilting in Mississippi and established the MS Quilt Legacy Committee in 2005. The purpose is to execute the search and documentation process and record the works of outstanding Mississippi quilters over the age of 65. 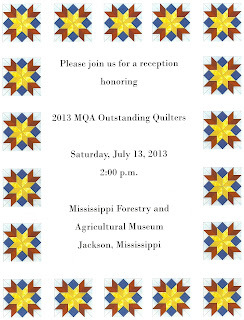 MQA accepts nominations for Outstanding Quilters, and these nominees are asked to display two of their quilts at the Mississippi Forestry and Agricultural Museum in Jackson from June through October. I have two quilts on display during this year's exhibit: "This Is My Story, This Is My Song" and "Finding My Way." The quilts are hung from the ceiling throughout the historical exhibit of items which represent Mississippi's cultural history. It is an honor to have my quilts hanging in this rich historical setting.